We’re fans of all types of film around these parts, and some of the best films of 2013 were feature length anime. I can’t pretend that Hayao Miyazaki’s The Wind Rises even comes close to fitting the “underrated” banner, but it led a particularly strong pack of films this year (it opens in Orlando at the end of February, but has already played NY and LA for Oscar qualification), films worth highlighting as much as any others — and that’s without having seen Mardock Scramble, One Piece Film Z or Evangelion: 3.0 You Can (Not) Redo. I always viewed Mamoru Hosoda as more of an art director than a storyteller, but he fully brushed that bias off of his shoulder with Wolf Children, a coming-of-age story about two half-human/half-wolf children and the trouble their human mother goes through in raising them after their shape shifting wolfman father is killed while out hunting to feed his new family. Before long the childrens’ wolf instincts get them from their Tokyo apartment and their mother decides to move them to a rural town to keep their secret safe. But once there, the secret becomes more explosive. It’s a touching story, and Hosoda’s comedic instincts are both well measured and well timed, something he didn’t manage to do in Summer Wars. Though it was originally released in Japan in 2010, it wasn’t until 2013 that Colorful became available in North America. It’s the story of a recently deceased boy who arrives to the afterlife and finds out he’s being given a second chance at life, albeit in the body of a 14 year old boy who has just committed suicide. He is tasked with discovering his own greatest sin in life, as well as discovering the secret of his host’s suicide. I had some problems with this film initially — the characters are very hard to like in the moment — but it’s grown in my mind in the months since seeing it and I find I appreciate the film the more I think about it and its maddening plot twists. Life and death are maddening ideas on their own, ones that you can’t shut yourself off to just because you don’t like the idea of it. From Up on Poppy Hill, a high school melodrama set right before the 1964 Tokyo Olympics, is somewhat of a departure from the norm for Studio Ghibli. Though co-written by Hayao Miyazaki with Ghibli regular Keiko Niwa, there are no flying pigs, wolf girls or floating cities. Instead, there is young love – and only young love. It’s a sweet film, almost an idealized film of youth and zeitgeist. 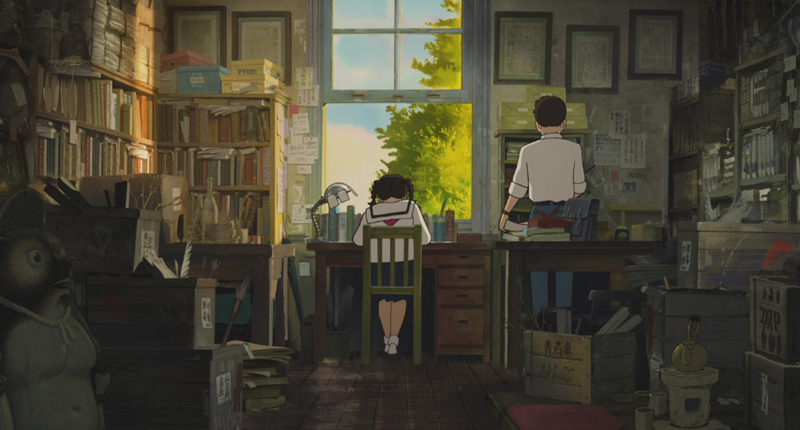 The analogies and metaphor might come from the manga that the film is based on, but the soft, measured feel of youth seems to come directly from Hayao Miyazaki’s memory, more like reminiscence than anything else. I do feel a little badly for Goro Miyazaki though, being stuck with that name and forever living under the eclipsing shadow of his legendary father. If he were Goro Suzuki, say, he might be regarded better, a good director but not a great director; at least he would be regarded without a qualifier. Makoto Shinkai and his team are simply the greatest and most detailed artists currently making features. The attention they give the photographic quality of art and the animation in their films is just staggering and worth any price to watch for by itself. Unfortunately the storytelling is a weak point in The Garden of Words, which is about a 15 year old boy who dreams of becoming a shoemaker who meets a mysterious older woman in the park on rainy days. While they bond over poetry and he makes a pair of shoes for her as a gift, the relationship is a little removed from reality. It’s too reserved to handle the burst of emotion in the climax. There is a point early on in Dreams for Sale, just as the story is beginning to find its way into a familiar destructive-depression groove, when every bit of logic in your brain tells you that A will happen to these characters as they move into the next act; or at least B will happen, certainly. Film being what it is these days, that’s usually the width of story options we’ve come to expect. So when Z happens instead, it takes moment to settle back down and readjust your brain. The Z in question comes after an accidental fire burns down the sushi restaurant that husband and wife duo Kanya (Sadado Abe) and Satoko (Takako Matsu) have gone into serious debt to build and make a success. Though the customers all make it out alive, the only thing left from the fire is Kanya’s chef’s knife and the huge burden of the debt. 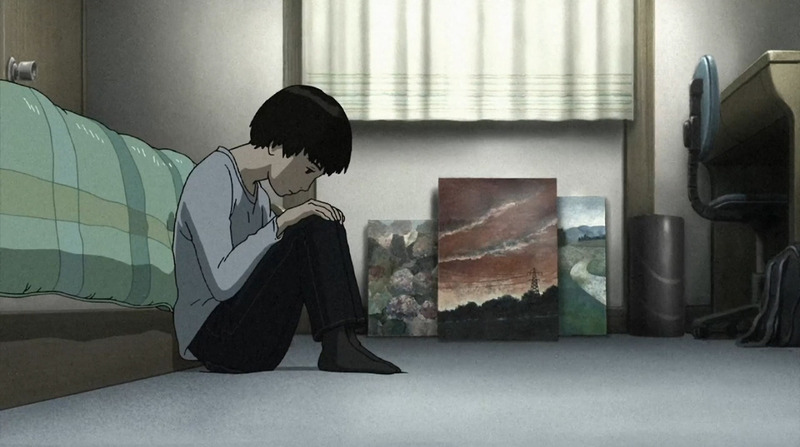 Kanya, depressed and feeling like he’s dragging everyone around him down with him, begins to withdraw from life, especially from Satoko, who offers him her meager life savings to help pay off their debt. In a final bout of blind self-harm, he finds himself alone in a hotel room with Rei, a friend who has just come into a thick envelope of money, a bribe so her paramour’s wife doesn’t find out. Initially upset over how he came into the money, Satoko decides against divorce and comes up with a different idea: to use Kanya’s charm on other women (women she thinks deserve it), for other thick envelopes of cash to pay off their debt, or better yet: to start up a new restaurant. That sidestep of the obvious story path is down to the film’s writer-director, Miwa Nishikawa, who spent parts of her early career working as an assistant Hirokazu Koreeda, who gave her a boost when he produced her first film, another twisty family drama called Wild Berries. Like Koreeda himself, Nishikawa has a knack for taking a straightforward and giving it a little flip, creating a new and unexpected experience. In Dreams for Sale, part of the drama comes from a little flip of Cyrano, with Satoko taking the behind the scenes role, puppeteering Kanya through some of the more emotionally manipulative moments of their con spree. Though he seems to take naturally to defrauding these women, Kanya ultimately struggles with his conscience in certain situations. This mark one of the few truly accessible emotional avenues for the audience to enter in and see through his eyes for a little. As you watch it, the film does occasionally feel meandering as it delves into Satoko’s lonely everyday life while Kanya is off his other women, but in retrospect these are some of the more interesting moments that the film offers. They drive home Satoko’s disconnection, as if she herself doesn’t quite believe this is the life she’s living now and can’t find a comfortable position in it. Dreams for Sale is a pure character study. It’s a difficult film, with a difficult culmination, but it’s one made with a keen eye and a steady hand. Slow and strange, constantly doubling back on itself to broaden the scope of the story, The Kirishima Thing is something like a less socially-conscious Japanese version of My So-Called Life, where the ubiquitously absent Tino is cast as an all star volleyball player — the titular Kirishima — who is at the center of everyone’s lives. Kirishima’s seemingly innocuous decision to quit the volleyball team sets off a chain of events that runs through the core of the painfully ordinary high school, causing a rift in the school’s social paradigm. 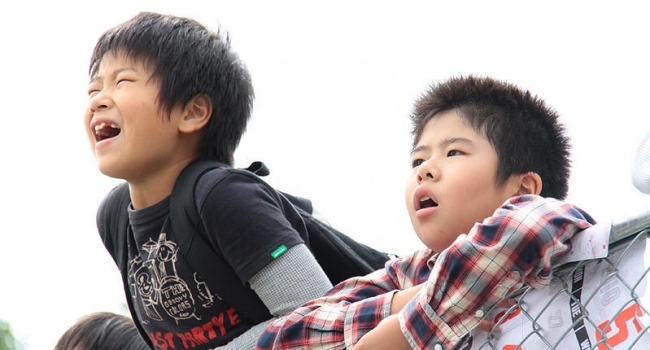 Though an odd choice to win the 2012 Japan Academy Prize, The Kirishima Thing is a well studied, subtle coming-of-age drama that reminisces about youth without idolizing or whitewashing it. When Liam Neeson opened the envelope at the 2009 Academy Awards and announced that Departures had beat out Waltz With Bashir, the supposedly mortal-lock winner, and another highly touted nominee, The Class, for Best Foreign Film, it was a shocker unlike anything seen since that category became remotely competitive. Departures was a film that, unlike Bashiror The Class, had not yet opened in America, not even on the festival circuit. No one had heard of this little picture, but still it ended up at the top of the heap. It follows the fate of Daigo (Masahiro Motoki), a professional cellist living in Tokyo. He is starting out with a new orchestra that promptly disbands, leaving him in the lurch and saddled with a huge debt to settle for his new cello – a gift to himself for getting into an orchestra. He returns to his home village with his wife, Mika (Ryoko Hirosue), where, trying to get back on his feet, he answers the world’s most poorly worded want ad. Daigo’s unexpected new gig is in “encoffinment,” working as a mix of undertaker and showman to prepare the dead for their next journey. It’s not something hidden away in the funeral-home basement, but rather performed as a ceremony in front of the family before cremation. It’s a superficial job on the surface, of course – death cannot be erased with a makeup brush – but it’s a profoundly soothing act for the families of the dead. To the living, especially to Mika, it’s a dirty, misunderstood occupation, one that causes Daigo many problems. Cellist, we get. It has some prestige to it. Music is lifeblood; it moves, ascends and takes you to another place. But a mid-row cellist in this day, especially in Japan, is not a necessary component of life. Entombing, however, is a vital part of death. Motoki plays Daigo with more of a pop-film slapstick edge than I would have preferred, but he never goes so far with it that it detracts from the story. When he does come perilously near the edge of that cliff, Tsutomu Yamazaki (his boss) and the always wonderful Hirosue are there to reel him back in just in time. It’s a tightrope Motoki and Yamazaki walked right to the Japanese Academy Awards as well, winning 10 overall. Am I giving awards too much importance? Probably, but it’s a noteworthy achievement for a film with no other discernible hook. Crouching Tiger introduced us to a vibrant new actress in Zhang Ziyi, and The Lives of Others tapped into both our national obsession with the Iron Curtain and our fear of government wiretapping and reprisal. But there is nothing so sparkling to this film at first glance. It’s a film about man’s mortality and how he handles it, but death is not cleverly hidden inside a bigger story. It’s a wake-up slap in the face about the gritty part of dying: the bodies. One could attempt to describe Katsuhito Ishii’s The Taste of Tea, but one would fail at doing so. Modest and understated, yet with much depth of spirit, it’s the kind of live action film that only an animator could direct, and, really, only a Japanese animator could direct. It is the story of a family, but not of their hardships or burdens, dark secrets, infidelities. We see them move through their daily lives, making incremental progress (or not), much like ourselves. Point a gun at my head and I suppose I’d have to call it a slice of life, but it is one of the most delicious, charming slices I’ve ever encountered, a joyful experience that isn’t cynically engineered to be joyful. Ishii doesn’t bother with manipulations to squeeze the joy out of us. Instead, the characters are left alone and observed, and it is fully an extension of the clear, straightforward humanity they possess that makes this such an exciting film to lie back and disappear into. As the film opens, we find young Hajime (Takahiro Sato) running after a train to try and scream a last goodbye to his crush as she exits his life. Hajime has never talked to this girl, afraid of what might or might not happen if he did. Not able to outrun the train to get a word in, he watches the train speed away from him. A shape starts to form on his forehead, and, slowly, the train he was chasing down emerges from his head, floating away into the clouds, the girl waving goodbye to him. On first viewing, it’s a shocking departure from reality that takes a while to come to terms with. But it’s the perfect way to set the film up, because this is the sort of thing that you need to expect from it. Anything can happen at any time. The film is not grounded in any kind of Earth-based reality, but is all the better for it. The Taste of Tea takes place in the sprawling countryside just outside of Tokyo, where much of the family commutes to by train to the city for school or work. The small, typical Japanese-style house serves as a central checkpoint for each family member along the way, but aside from Yoshiko (Satomi Tezuka), the mother, who spends all of her free time at her kitchen table animating, trying to get back into the game now that she has time again, most of the film takes place in school rooms, offices and recording studios, on trains and casual strolls, where a gust of wind is as important as a gunshot in the scheme of things. Strange things are occurring to Hajime’s younger sister, Sachiko (Maya Banno), too. Apparently suffering from an early onset existential crisis, she is being shadowed throughout the day by a big version of herself. It sits and watches her at home and at school, curious and half bored like staring into a fish tank for too long. Sachiko is bothered at her core about this, but keeps it to herself. Ishii is possibly more well known for his “wacky-Japan” type films, like Shark Skin Man and Peach Hip Girl, Party 7 and Funky Forrest, all starring the somewhat enigmatic Tadanobu Asano, but he finds his real calling here, I feel. It’s an incredible accomplishment to direct something so subtle, especially when your instinct seems to tell you to go big to get the laugh. But there are just as many laughs here in the quiet movements of The Taste of Tea, which features Asano as well, but in the smaller role of Uncle Ayano, a sound mixer from Tokyo whose existential crisis takes on a different shape than Sachiko’s. Like I said in the open, one could try and explain this film and easily fail at doing so. And I have, I know. It’s almost pointless to keep trying, because I keep getting further from the point the more I write. There is no explaining Grandpa (Tatsuya Gashuin), who is the force behind the film in many ways, for instance, nor the path Hajime decides on taking when he falls in love with Aoi, played by the lovely half-Japanese, half-Russian Anna Tsuchiya. It’s an elusive film that exists entirely in its sense and feel. To put it in sports terms, The Taste of Tea is all intangibles, delivering exactly what is needed when the time comes. Absurd and lovely in equal lengths, beautifully photographed and acted (and animated at times), there is a great and gentle beauty to it, a drifting, gauzy summer lushness that will take you away from yourself for a little while if only you’ll let it. A little bit of faith in the film brings with it a deep reward. It might not help you shake any demons off of your back permanently, but it might put a smile on your face and scare them away for a while. 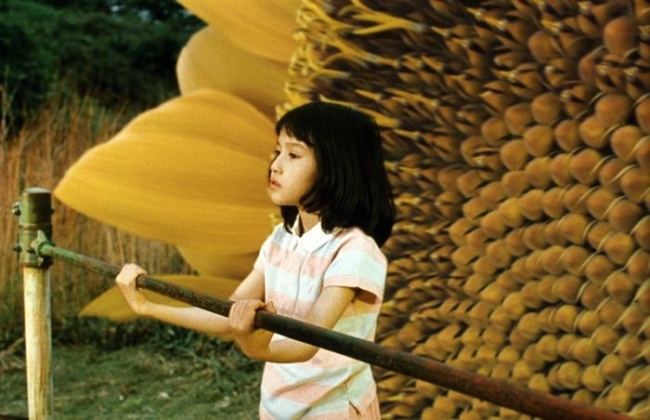 In the normal run of things, there are very few love triangle films you would ever find me enjoying on the sly, let alone openly praising and defending, but Shunji Iwai’s Hana & Alice is one of them. A beautiful, deceptively complex film, one that is as touching as it is funny, and one that works just fine on its surface but that gets better and better as you peel back the layers, Hana & Aliceconcerns the lives of two teenage girls living in the suburbs of Tokyo as they are about the graduate junior high and move on to high school. Hana (Anne Suzuki) and Alice (Yu Aoi) have been joined at the hip for years, best friends that are so similar and used to each other that they move in unison, something helped along by their ballet classes. When we first meet them, Alice has fallen deeply in love with a boy she sees on the train platform every day, a Japanese-American mix who Hana isn’t interested in. As an aside, mostly joking, Alice says she can have his little brother, Miya (Tomohiro Kaku). Hana’s nose immediately crinkles at the idea, but its posturing to hide the embarrassment from Alice. Her eyes tell the real story: something in her brain makes her want him. What exactly that is is hard to say. Thinking back on some of my high school crushes, I can’t explain the attraction either. It was just a fact. Like the sun rising every morning and setting every evening, there was a crushing weight on my shoulders. I’m somewhat hesitant to provide a synopsis because the film defies explanation, really. It is the sort of silly-serious material that needs the right hands to works, and in Iwai, it does have the right hands. Iwai is a master filmmaker, and material that would be weak and frivolous in anothers hands are spun into lace by his. We are meant to laugh a little at the girls, at the lengths they go to for such a fleeting end, but we are meant to empathize with them as well, to see the silliness through their eyes, to see that it’s not silly at all, it’s just one of those things that slowly gathers an unstoppable momentum. The film actually began life as a series of internet shorts commissioned by Kit Kat Japan for their 50th anniversary. Its popularity quickly sent it into a feature production, but the film still has a vignette feeling to it, weaving together several concurrent stories rather than relying on a heavy plot. At it’s core, the film is essentially a gentle stalker comedy, but it is so intensely self-aware of what its comedy is, where it is and how to mine it, that it somehow manages to escape creepiness. 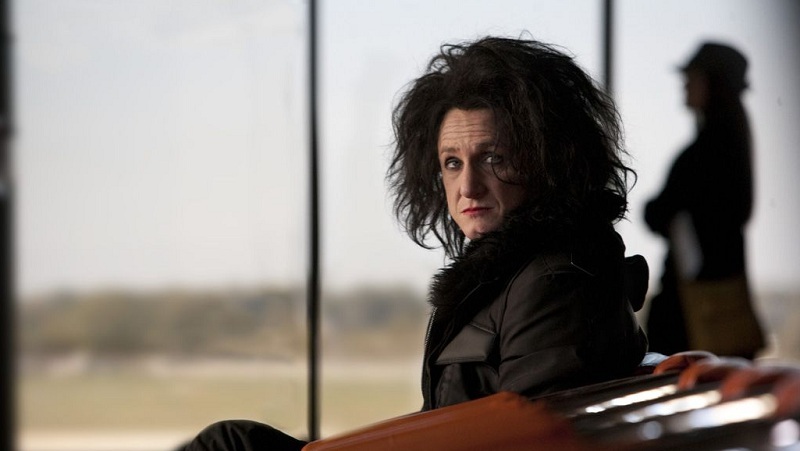 Any hint of creepiness is immediately defused by subtle absurdities, well timed self-deprecating jokes and ultimately by the lively charm of characters themselves, even though the spin out of control into a jealous rage over Miya by the end. Love triangles are one of the worst inventions of life, never mind the movies. Guys fight over girls, girls fight over guys. It’s usually for shallow, petty reasons, where the girl or guy in question has been stripped of their flesh and humanity, transformed into a golden statute, a trophy to win. Positive traits are hyper-focused on and the openly visible negative traits are handily ignored. In the end, they are hardly ever worth all of the anguish and bickering they cause. Most love triangles, though, are a natural outcropping of competitive relationships, where you want to possess the things your friend wants or already has because of our stupid lizard brain remnants. It comes in quite a different flavor in Hana & Alice. There is no machismo or cattiness to contend with here. In fact Alice is only spending time with Miya as a favor to Hana to deepen the “truth” of the game she is playing with him. In Alice’s desire to please her friend, she builds an even more elaborate game with Miya, one that they both have trouble easily dismissing. Whenever I show this film to someone, or make them watch it against their will, they always turn it into a contest of which girl they like better. The answer is always – always – Alice. Even the girls pick Alice. It’s not hard to see why people would immediately pick her. She is adorable, sweet, intelligent and quick witted. Her ballet makes her graceful, and we see all of that right out in front. I’ve never personally made a decision between the two. I like Hana as much as I like Alice, though for conversation’s sake I usually side with Hana because no one else does. You have to work for her, take time to consider what makes her tick. On the surface she appears to be the more mature one, more eager to be an adult and quickly grow up than Alice. But inside she still retains the romantic notions and emotions of childhood, though they manifest in decidedly mature ways. Whatever her deceits, they are very adult in nature, even if the intent behind them is juvenile. Much of the material added to make it feature length focused on Alice’s family, so Hana lacks a certain depth of story development, but there is enough visible to make small leaps of faith about her character and background. In that way, she is a little bit more rewarding a character to spend time with. There is a hazy quality to the cinematography, something like a shadowy, overcast day that follows the film around, even in the bright sunshine of the spring scenes. It works like magic to the film, making it feel more like the fairy tale, and even though I know in my head that it’s just a problem inherent in old digital cameras (Iwai has shot much of his work on video instead of film), and I know how much I hated digital cinema until very recently, I can’t help but give it a pass in this film for the magic airy feeling it inspires in the film. I say airy, but really it’s more about a heft. These problems in these years of a persons life are heavy stuff. There is a reason why everyone can identify with Charlie Brown and the rain cloud above his head, and that’s exactly the feeling that is evoked here. The film was shot by Noboru Shinoda, and was one of the last films he worked on before his sadly premature death in 2004. Shinoda, who appears in a cameo role as a commercial director, and Iwai had a working relationship that went back to 1994 when they made the short film Undotogether. Over 10 years they worked together often, building a truly unique visual style together. He was the cinematographer for every feature length film Iwai had made up until his recent film,Vampire, Iwai’s first feature length English film, which failed to secure North American distribution after mixed reviews at Sundance. Between 2004 and 2009, Iwai only has a documentary on Kon Ichikawa to his credit, and I don’t believe it an accident, I believe it to be a period of mourning for his friend, who was such an important part of his films, and who might have gone on to direct his own as Iwai moved into more of a mogul role, giving directing opportunities to others he’s worked with over the years on films like Rainbow Song, Halfway and Bandage.